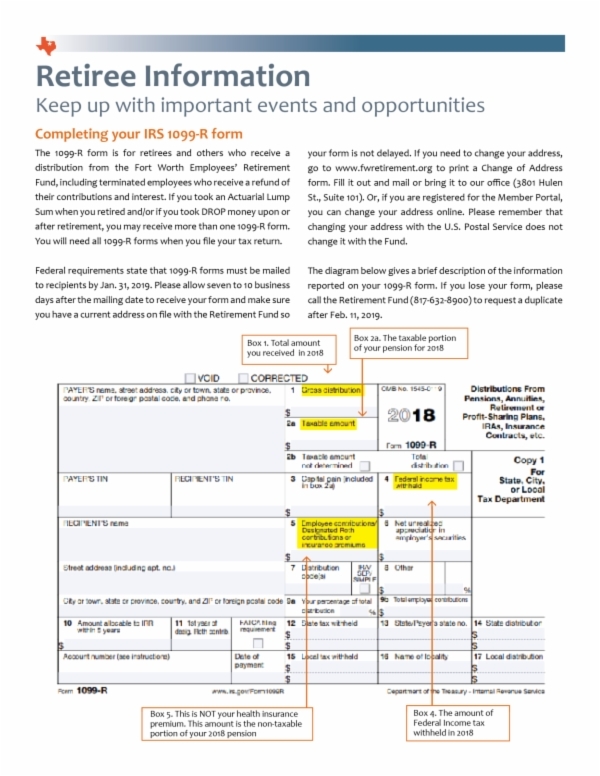 Your 2018 1099-R forms were mailed to you in January 2019. If you have not received your form(s), please call the Retirement Fund at 817-632-8900. Our regular office hours are 7:30 a.m. to 5:30 p.m. Monday through Friday. The 1099-R form is mailed to retirees and others who receive a distribution from the Retirement Fund, including terminated employees who receive a refund of their contributions and interest. If you took an Actuarial Lump Sum when you retired and/or if you took DROP money upon or after retirement, you may receive more than one 1099-R form. You will need all 1099-R forms when you file your tax return. The Winter 2018 Retirement Fund newsletter, Cowtown Retirement News, contains the article below about the 1099-R form and the illustration that may help you complete your form (page 7). All newsletters are available on this website under Forms.